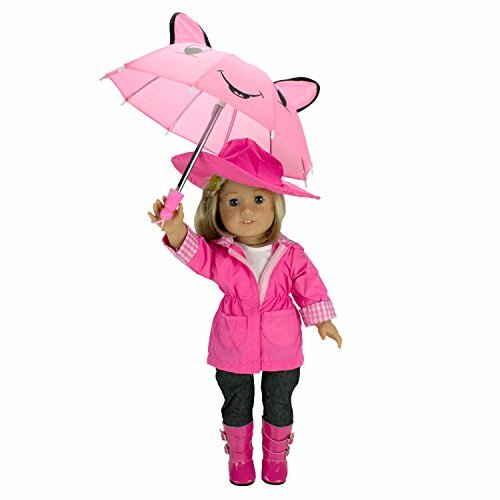 Rainy Day Outfit Set For American Girl Dolls- Includes Raincoat, Umbrella, Boots, Hat, and Shirt. From the makers of the best selling Ride Along Dolly Bike Seat comes a line of doll clothes that will make your favorite American Girl or other 18 inch dolls' heart melt. Dress Along Dolly Clothes are all hand made, and custom designed to give your doll the unique look that you want. These are truly unique designs exclusive to Dress Along Dolly-you won't find these clothes in any store. Show off your doll in style. Fits any standard doll of approximately 18 inch height, including American Girl Dolls. Perfect holiday or birthday gift for daughter, niece, or granddaughter- They will love dressing their doll up in this adorable set!